As many of you are probably already aware, the Pantone color of the year is a lovely reddened-orange color called "Tangerine Tango". I have personally been obsessed with this color for about the last year and a half but I wanted to share my peachy-orange tutorial inspired by this shade with you. It is a very intense, saturated orange which may be off-putting for some, but I promise it is much easier to wear than it looks! I subdued the eyes, created contoured peachy cheeks for that bronzed glow everyone loves for Spring, and some statement lips to add some drama. 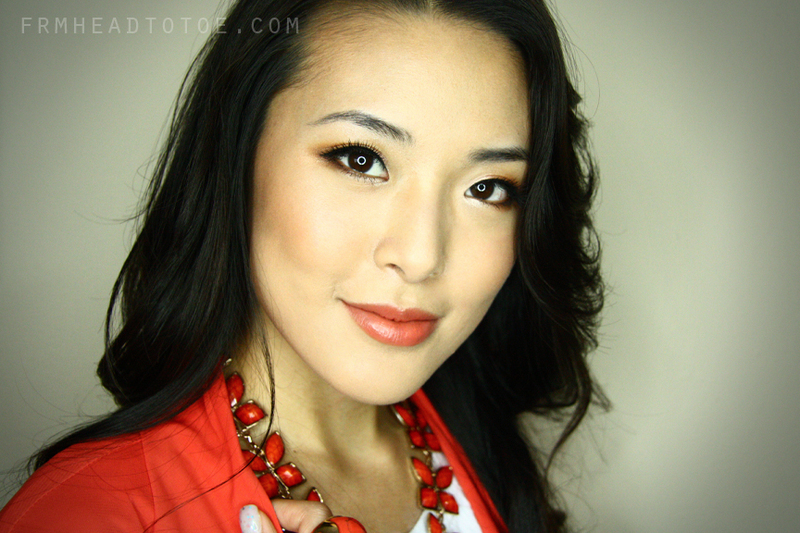 To see the whole video tutorial and breakdown of the look, read on! I'm someone who loves to wear color but at the same time I want the look to be flattering so that it enhances my natural features. When I was growing up, my mom always told me to avoid orange and yellow because it would clash with my natural yellow undertones. It took a long time before I was brave enough to try it out anyway and fell in love! My shading technique here is along the natural contour of my eye socket (not too winged) which works well for a natural, everyday look. In the image below, you can see that although each peach/orange is a different shade, they all coordinate by being in the same color family. You can try this out with all pinks, purple/mauves, or bronzes as well! THanks so much for the tutorial Jen! I love this look!!!! You're so pretty....I like orange colour too, especially for lips...thx for sharing..
oh god, you are so gorgeous. i wish this kind of make up looked as good on me! my favorite color is orange! This is a great tutorial Jen! I love it! amazing tutorial jen! i love your videos :) would you be able to someday do a tutorial on how to apply white eyeliner (on the lower lids) along with black liner, sort of Kate-Middleton-style? it's a look I always see yet have trouble pulling off because of the different shapes of my eyes. I absolutely LOVE tangerine orange!!! I notice I've been gravitating towards orange a lot lately. I love the accessories you have on! i just recently did a blog post about accessoreis! check it out! Very very pretty look! Loved the tutorial. It will mean the world to me if you will visit my blog! You're so pretty! lol, do you think you could do this type of look for every color of the rainbow? Hi Jen, Question for you, do you use any eye cream? im going over your beauty routine posts and didnt not see any? My skin underneath my eyes are super dry and its making my makeup very cakie looking. Any advise would be awesome! Thanks! 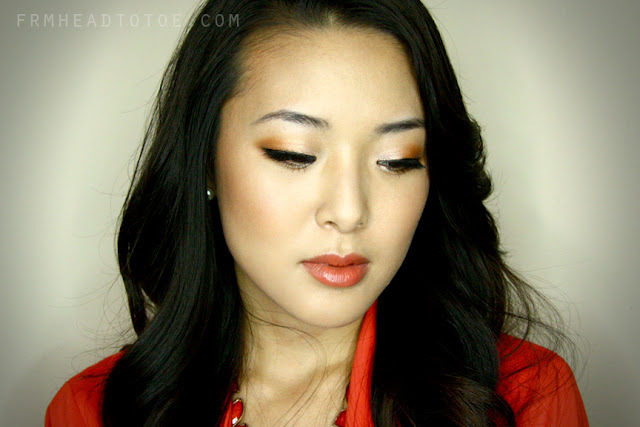 Sometimes I forget how flattering orange can be on someone who has golden undertones, like myself. One of these days, I'll find myself sporting a bright orange lip - thanks for the encouragement! Hi jen want brand of false lashes are you using? I honestly don't remember... They were two natural pairs of falsies that I layered to give a fuller but natural effect! What bottom would you recommend to pair with the tangerine blazer? this color looks amaze on you. I could never pull it off. gorgeous you!! xO! you're amazing! this is the first video i've ever watched of yours and this is my favorite color. i also have mono eyelids so this is really really helpful! i'm going to use this for a photo shoot i'm doing with my boyfriend! Week in Instagram and Giveaway Update!